Whether Burnet(t) evolved from Burnard/Bernard or was an individual surname in its own right has been debated. Whilst 11th century records of Burnard/Bernard exist in Anglo-Saxon England in Bedfordshire, Hampshire and Wiltshire and later in the 13th century in southern Scotland, there are several instances where the name can be shown to be interchangeable. There are also differing opinions as to whether the early members of the family had Norman or Anglo-Saxon origins. Burnards were given the large barony of Farningdoun / Farnington in Roxburghshire, Scotland under a new system of land-holding instigated by King David I. As King David had a particular wish to introduce Norman or Flemish settlers to his Scottish kingdom it would not be unreasonable to assume that the Burnards were of that extraction. In this area the name evolved to Burnet and the family became associated with the lands of Burnetland and Barns. A John Burnard accompanied King David II on his journey south ending in the defeat of the King at the Battle of Neville’s Cross in 1346. Burnard, who owned Scottish lands of Ardross in Fife and of Currie in Midlothian, was killed in 1346. Alexander Burnard had his services to King Robert I rewarded by the granting of lands on the banks of the River Dee, in the parish of Banchory Ternan west of Aberdeen. He was, for a time, Keeper of the adjacent Royal Forest of Drum, the badge of office of which is considered to be the Horn of Leys. The procedure of ‘Cornage’ comprised the use of a symbolic horn in the process of land grants (a form of lease from the Crown). 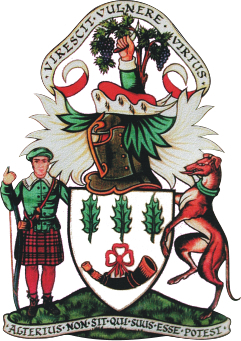 His descendants, the principal family of Burnett of Leys, gave rise to a number of branches in north- east Scotland namely Burnett of Craigmyle, Burnett of Camphill, Burnett of Crimond, Burnett of Kemnay, Burnett of Elrick, Burnett of Countesswells & Kepplestone, Burnett-Stuart, Burnett of Lethenty, Burnett of Kirkhill, Burnett of Daladies and Burnett of Powis along with Burnett of Monboddo and Burnett-Ramsay of Balmain both in Kincardineshire. From the 16th century the main residence of the Burnetts of Leys was Crathes Castle and the present Chief of the family James C. A. Burnett of Leys lives nearby at House of Crathes. The Burnetts of Leys also acquired and extended Muchalls Castle, located a short distance away near the coast, completing the work in 1627. The Coat of Arms of the Burnetts of Leys contains a Hunting Horn and three Holly Leaves. The earliest known seals of the Burnett family show a leaf and later three leaves on a shield. Their 12th century use probably indicated the agricultural lifestyle of the family. 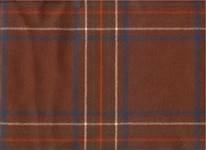 Alexander Burnard was a supporter of King Robert the Bruce and in 1323 was granted the Royal Forest of Drum. Part of this part land was later given to another supporter, William De Irwin, and both became keepers of the Royal Forest. Thereafter their arms consisted of a shield emblazoned with three holly leaves and, in the case of Burnett, a horn of office. These shields represented the official Arms of the King’s Steward who would have displayed on his shield and upon his banner, the holly leaves as an official cognisance under which the King’s tenants would have, when required, join the feudal array of Scotland. There is positive evidence that the family coat of arms contained the Horn and Holly Leaves as early as the 16th century and it is assumed that the Horn itself was given to Alexander Burnard as a symbol of the Office of Royal Forester. The modern variant of the coat of arms has been used to identify the Leys Estate activities which include the companies within the Bancon Group. The Horn of Leys remains in the ownership of the Burnett family and is on display at Crathes Castle. In 1822 the first Royal visit to Scotland since 1651 took place. The visitor was the newly crowned King George IV. 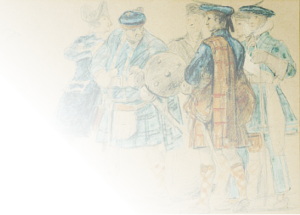 The arrangements were masterminded by Sir Walter Scott who encouraged the Highland Chiefs to appear before their sovereign in tartan. 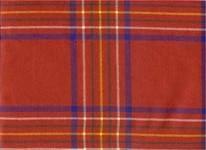 Very few chiefs knew what their tartan was, and an enterprising weaver, Mr Wilson by name, who resided at Bannockburn near Stirling, obliged by producing suitable tartan patt erns. Pictured here is the coat of arms of the Chief, James C. A. Burnett of Leys. As with a crest, there is no such thing as a “family” coat of arms. Only one person may use a coat of arms at a time, so not even the Chief’s son may use the exact same coat of arms while his father is alive.That said, it is important to add that anyone may display a coat of arms so long as it is clear that there is no improper claim to ownership. To access House of Burnett membership, members must be of the name Burnett, Burnet, Burnette, Barnet, Barnett, Barnette, Bernit, Bernat, Burnap, MacBurnet, or other spelling variation; married to a Burnett; or descended from a Burnett in either the male or female line. We are the official website of the Burnett family. We provide information for all those associated or interested in the name of Burnett, its origins in Great Britain (Scotland in particular), and its history and traditions throughout the world.